~~America once a thriving and prosperous nation, now an empty decaying wasteland—everything changed in the blink of an eye. 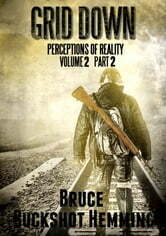 In Grid Down Reality Bites, a high-altitude nuclear blast causing an EMP (electrical magnetic pulse) destroys the power grid, catapulting life as they knew it, back to the 1800’s. The saga continues in Grid Down Perceptions of Reality (volume 2, part 2), A small band of survivors desperately struggle to survive the chaos that ensues. Now a post-apocalyptic world, they must rely on their primal instincts to escape destruction, disease and death. In this book, the story of Grid Down continues, following Clint and Junior with their small band of survivors. When we last left Clint and Junior, both were suffering gunshot wounds while trying to escape after an attack on a group of Rainbow Warriors (Grid Down Reality Bites, Chapter 37). Great read. I really enjoy the survival tips clearly took years of research and knowledge to write this. Exciting story line to keep you turning the pages.
! Think we have lost control of who is where and how we can line up the other guys.its to frustrating and it seems money is the issue here.I remember the old soaps the ole lady used to watch and this story feels like that which I don't want to endure .if the next one digs an even deeper hole I'm gone.